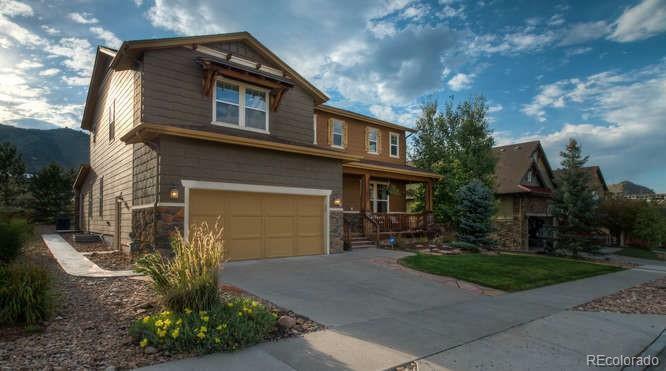 Check out this one-of-a-kind 6 bed/4 bath home in the highly sought after Canyon View subdivision in Golden. Unique home with 4-season luxury addition truly bringing the "outside in" and the "inside out" to enjoy year-round. The main floor is open and bright with a huge family room and open kitchen with upgraded stainless appliances. The upper level has a spacious master bedroom with 5-piece bath and walk-in closet, as well as 3 additional bedrooms, full bath, laundry, and large loft. The finished basement offers 2 additional bedrooms (one presently being used as an exercise room), one full bath with steam shower, and huge great room with wet bar for family enjoyment. The backyard area has a large patio for outdoor fun with views of Mt Galbraith. From the front deck there are views of North Table Mountain. NO HIGHWAY NOISE!